As part of a major enlargement, the Shenyang Conservatory of Music purchased a combination organ comprising of a Rodgers Custom 968 digital organ with pipe ranks designed and built by MPOS. A standard MPOS pipe module was enlarged to include a full 8’ Open Diapason, with the bottom octave in the equivalent of pedal towers. The speaker for the digital stops is contained entirely within the pipe casework. The installation included adjusting the wind pressure and pipe voicing to give the best effect within the building. 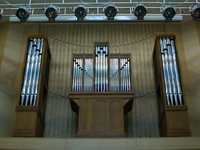 The digital sections of the Rodgers organ were also voiced by the MPOS team using traditional voicing techniques so that both the pipe and digital stops speak together with complete integrity. The installation on site was undertaken by MPOS in conjunction with Rodgers Hong Kong over a 2 week period during November 2006. The organ fills the 800 seat hall to great effect and accompanies a full orchestra successfully. It enables the Conservatory to meet their aim: “to make even greater contributions to the cause of Chinese art, and music, and dance education”. It is believed this was the first pipe organ in North Eastern China and hope that the combination of MPOS pipework with the Rodgers digital organ will expose an entirely new culture and generation of students to the delights of the pipe organ. As part of an investment for the future ministry of the church, a Rodgers digital console was purchased and MPOS was asked to restore the remainder of the disused pipes.